With a stay at Hotel Estelar Playa Manzanillo - All Inclusive in Cartagena, you'll be 0.1 mi (0.2 km) from Playa Manzanillo and 5.4 mi (8.7 km) from La Boquilla Beach. Featured amenities include a business center, dry cleaning/laundry services, and a 24-hour front desk. A roundtrip airport shuttle is provided for a surcharge (available 24 hours), and free self parking is available onsite. With a stay at Chrisban Hotel Boutique in Buga, you'll be a 3-minute walk from Buga Culture House and 7 minutes by foot from Basilica of Our Lord of Miracles. Located in Cartagena (Cartagena Walled City), Casa Pedro Romero is within a 15-minute walk of Puerta del Reloj and San Felipe de Barajas Castle. The front desk is staffed during limited hours. With a stay at Hotel Puente Piedra in Villa de Leyva, you'll be within a 10-minute drive of Villa de Leyva Plaza Major and Casa Museo Luis Alberto Acuna. Free self parking is available onsite. 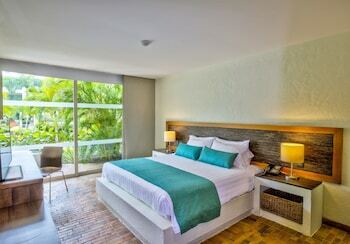 With a stay at Terrazas Tayrona Apartamentos By CHD in Santa Marta (El Rodadero), you'll be within a 10-minute drive of Bello Horizonte Beach and Rodadero Beach. Free self parking is available onsite.